Photographer and author Linda Pitkin specialises in underwater photography and she spoke to ePHOTOzine about life under the ocean waves. Photograph of Linda Pitkin by Brian Pitkin. A passion for nature led Linda Pitkin to a job as a biologist and photographer. Until recently she worked in insect research at The Natural History Museum, London and pursued her underwater photography career alongside that. "I had no idea it would amount to much, but it snowballed gradually from small beginnings. I was self-taught and I learnt from other photographers, particularly at the British Society of Underwater Photographers." Obviously knowing how to dive is a skill required for this role and Linda began diving in 1979, a year before she took up underwater photography. "I didn't plan any of it, but it was fortunate it happened that way as it gave me time to get familiar with diving and master the skills adequately first." 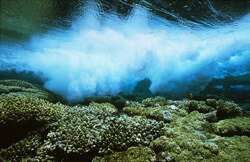 The marine environment has so much to inspire a photographer. There's an array of colours, fascinating forms and interesting light for you to play with. But to see this you actually have to get down there first which can be harder than it seems. Diving gear and housings which are used to protect your equipment are heavy to carry on land and it can be hard to move. But once your underwater you will find it much easier. "It is often more relaxing, especially as we tend to spend a while in one spot, waiting for the fish to get used to our presence. That can be frustrating at times though, when the limited dive time is slipping away and the fish are not cooperating. 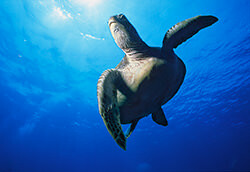 At the end of a day's diving, I am usually exhausted and sleep well." Talking to contacts and looking through magazines and online sites will give you ideas and places you can dive. Regular underwater photographers share their experience about locations and dive operations so using their sites as a place for research would be a good thing. Also check to see if you need permits. This can be organised by yourself or your dive operator. Fish look their best close-up but remember not to interfere with them too much, after all they look their best in their natural state. 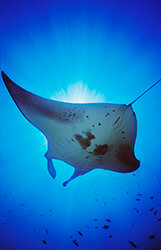 "It is good to follow the Underwater Photographer's Code" explained Linda. Luckily Linda says most fish are approachable but getting to know their behaviour and which species will be more willing for you to get close will help you produce better and quicker results. It's best to move in gradually, watching how the fish react to you. This also gives them chance to get used to your presence. "I try to avoid any sudden movements, especially with my arms, and I try not to breathe out when I'm close to fishes, or at least while I'm facing them, as the bubbles will alarm them. Some photographers like rebreathers (closed-circuit diving equipment that doesn't give off bubbles) for that reason." 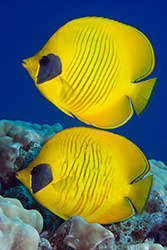 Keeping still will also help you capture that perfect close-up of a tropical fish and buoyancy will help you with this. 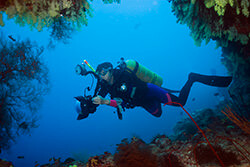 Divers use weights and a buoyancy compensator, which allows air to be let in or put out to achieve their desired buoyancy. "This is especially important for underwater photographers as we get very close to our subjects and have to be extra careful to avoid any damage to reefs, corals and other animals. If there is a suitable sandy place on the seabed to settle gently, without kicking up sand, that can be useful." Everything moves underwater, even you so creating a perfectly still image can be a challenge, but the odds can be swayed in your favour by using flash. "I use flash in most photographs, if only as foreground fill-in, and that freezes most unwanted movement. I try to freeze too. Even if I am swimming with a subject, I stop and hold still when I see the shot I want in the viewfinder, and I stop breathing at that moment. It is dangerous to hold your breath while ascending, but I do it only when I am stationary." Diving comes with its dangers but if you're well trained, pay attention to what you're doing and don't do anything beyond your capabilities then you will be generally safe. Some of the sea's creatures, particular sharks get bad press and are stereotyped as attacking predators which Linda says just isn't true. "Sharks have had an unfairly bad press - Jaws has a lot to answer for! 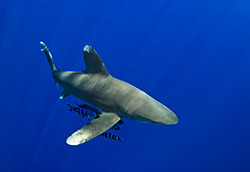 Most sharks and other large predators are actually shy, as any photographer of them will be aware. Hazards come more from more innocuous looking animals, that can sting or have venomous spines, but if you don't touch or harass them, there is little danger from marine life." Not only does flash help with creating a still image it can help with colour too. Marine life is very colourful but water absorbs light, starting with the red end of the spectrum, so the colours appear muted and the deeper you go the bluer everything gets. To get the full colour range back Linda uses flash unless she's near the surface, then she just gets very close to the subject, putting as little water between her lens and it as possible. For macro shots flash is her primary light source. She used to use a single flash but now she uses two, set to unequal power. "I have diffusers on them to soften the light. For wide-angle views, I use flash more as fill-in, or balanced with available light. There is a surprising amount of light underwater, especially if you shoot from low angles, pointing upwards. I now have two Inon Z240 flashes (strobes). They are very lightweight (handy for travel) and I use them mounted, well away from the lens, on arms that can bend so I can angle them where I want." Surroundings and background are a crucial part of underwater photographs and Linda chooses to compose the whole image not just capture a single subject. "I usually move around the subject looking at different viewpoints and angles. I use a variety of angles, and it depends on how I visualise the subject at that moment. A low angle of view often helps to make the subject look dominant and to isolate it from a cluttered background. I often use three-quarter views for fish portraits and I am a great fan of diagonal compositions generally." On her trips Linda takes photographs from early morning into the late afternoon and sometimes at night. "For shots where natural light is an important consideration my favourite time is mid afternoon, when the rays of light through the water are lovely if I stay shallow. Time of day also affects which lens to use on a particular dive, I have to consider what subjects I expect to find, and what I can do with them at that time of day. My current favourites are Tokina 10-17 mm fisheye (not popular with land photographers but great underwater), and Nikon lenses 20 mm and 60 mm macro." Currently Linda uses a Nikon D80 and she has it in a Sea & Sea underwater housing. "You do have to watch out for floods (i.e. water getting in) with equipment underwater, and it is important to get the salt off by washing the kit carefully in freshwater after every dive, and to check the sealing o-ring carefully." She doesn't have the luxury of a team which just goes to show you can take great pictures without hordes of equipment and assistants. "I just keep my equipment simple," explained Linda. Most of the time there isn't much that needs altering in post-production. Linda may alter the levels a little and do some work in the raw conversion of her digital images which mainly revolves around curves and colour balancing. She may also have to clean up some of the backscatter (particles in the water) but often she finds it easier to just leave the image out and go for ones where she got it right in camera in the first place. Like many areas of photography underwater photography has too seen a growth in the number of photographers trying to make a living from pictures taken under the sea, something which Linda is luckily still doing successfully. "I have stock photographs with agencies, mainly with NHPA and a small number with Getty, and I also supply my images directly. They are used in books, magazines and in advertising. I have written four of my own books featuring my photographs, and I have an exhibition of 18 fine art prints, currently at the ZSL London Zoo's Aquarium. When I get the opportunity I do commissions, and I was recently sent to Corsica for the nature project Wild Wonders of Europe. I love what I do and being underwater and having all the amazing wildlife around is fantastic, but I couldn't imagine diving without my camera now - it would be too frustrating to be missing the opportunities." If you want more tips or to see more images visit Linda's websites: Linda Pitkin Tips and Linda Pitkin.